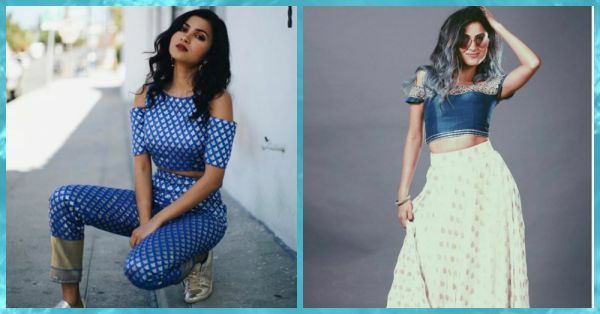 YouTube Sensation Vidya Vox Is Giving Us Major Shaadi Fashion Inspiration - Here's Proof! We all know the 27 year old famous Youtuber and singer Vidya Vox for her quirky mashups, music collaborations and a fan list that includes the who’s who of Bollywood. But do you know that the spunky girl has an awesome style quotient too? We think her desi fusion style would be quite a hit this shaadi season. Here are 8 times when the awesome singer gave us some serious wedding dressing goals! Don’t forget to add a touch of awesomeness into your Indo western look with these amazing statement fringe earrings available on Pernia's Pop Up Shop for Rs 4,800. 2. When she looked oh-so amazing in a crop top and lehenga combo! We are telling you, we would LEGIT to steal this look for an outdoor mehendi or even a daytime shaadi. It is such an easy avatar that looks well put together without trying too hard. Brownie points to the cold shoulder detail in the blouse. Love! 3. When she redefined desi chic! We just can’t take our eyes off this beautiful crop top and skirt combo with the paisley motifs. It adds a quirky edge to the overall look. The belt too is a welcome accent! Would surely look awesome on a glitzy sangeet function or at a sparkly cocktail night. A touch of red lipstick will help complete this desi chic avatar. 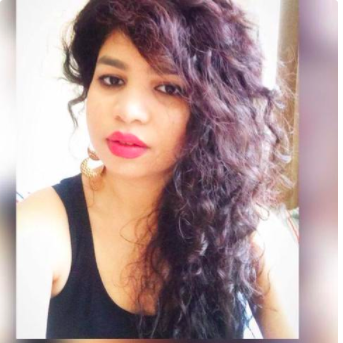 Our favourite is M.A.C’s Ruby Woo which is available on Nykaa for Rs 1,500. This look is the one we would happily like to steal for a groovy sangeet party. The green brocade blouse paired with an airy lehenga that ends much above the ankles, looks elegant and seems so fuss-free. Great for when you want to dance the night away without having to play tug of war with your outfit. 5. When she clicked a selfie in a shaadi ready lehenga! Apart from being the unavoidable picture with your bestie, we just can’t help but notice the gorgeous pink and golden lehenga that Vidya wore. We mean, what’s not to love! Everything from the banarasi lehenga to the bright pink dupatta are pure #weddingoutfitgoals! The A- line ghera skirt is such a beautiful contrast to the black bustier blouse! This look is all about being boho chic and would be perfect with some statement earrings and a stunning choker. What do you think? 7. When she gave us serious fusion wear envy! If you are one of those who want to stay away from the regular shararas and lehengas and wouldn’t mind experimenting a little, then this look is for you! The awesome silk trousers and half lehenga combo is unconventional and glamorous. Great for when you want to look stylish without compromising on the comfort factor. Match the glitziness of your attire with a sparkly eyeshadow like this from PAC available on Nykaa for Rs 350 only!